This test provides a fair and highly reliable assessment of the ability to inhibit overlearned answers to simple tasks. Registration of the color-word interference tendency, i.e. impairment of the reading speed or color recognition due to interfering information; applicable to adults. Main areas of application: clinical psychology and neuropsychology. Determination of the color naming speed. The task is to press the correct respective entry field or color button as fast as possible. Generally four test forms are available. Test forms S4, S7 and S10 determine first the "baseline" then the "Interference condition". The three test forms vary as regards the input medium and the instructions (the respondent names / does not name the color aloud). Test form S8 differentiates between so-called "congruent" items - color and meaning of the word match - and "incongruent" items - color and meaning of the word DO NOT match. The main variables are reading interference (the difference of the reaction time medians of the "reading interference condition" and the "reading baseline") and the naming interference (the difference of the reaction time medians of the "naming interference condition" and the "naming baseline"). Additionally, the following variables are issued for each individual test part: "Median reaction time" and the "Number of incorrect answers". The test protocol shows each single reaction of the respondent with reaction time of the respondent and evaluation of the reaction. The split-half reliabilities for the norm sample varied between r=.85 und r=.99. The validity of the test STROOP-Tests is confirmed by numerous comparative examinations with clinical groups and healthy people (extreme group validation), as well as by examinations regarding its convergent and divergent validity. 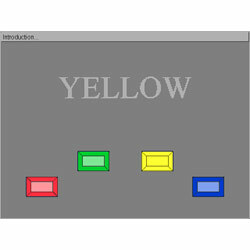 The computerized form was designed exactly according to the paradigm of the color-word interference by Stroop, taking into account further scientific developments (e.g. Bäumler, 1985). It proved that patients with cerebral lesions require much more time to do tasks under interference conditions, and that the test STROOP differentiates reliably between patients and healthy people (c.f. Perret, 1974; in Wittling, 1983; Beaumont, 1987). A comparative sample of N=254 normal people is available for form S4. A standardization to normal persons (representatively) is available in each case for forms S7 (N=343) and S8 (N=327). They consist of data from the Schuhfried Company's research laboratory.